◊ 'AA' Class Erection of Temporary Monsoon Shed Services that are Reliable and Durable with the help of materials that are entirely ours. 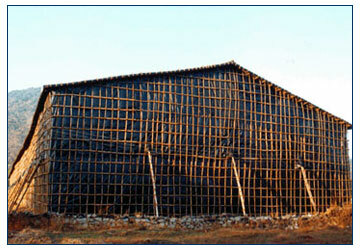 ◊ The Core structure of the Monsoon Shed is dependent on the Quality of Material used to construct the scaffolding. 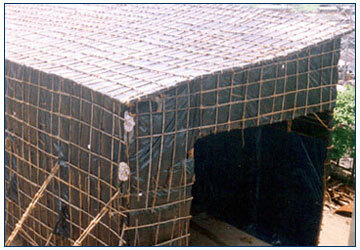 To maintain its durability, we use High Quality Suru Ballies, Bamboos and Specially made Coir for our structures. ◊ Rooftop is covered with 250 GSM 100% Waterproof HDPE Tarpaulin and to make the shed leak proof, an additional layer of heavy duty LDPE/Silproof Rigidex liner is placed on top. 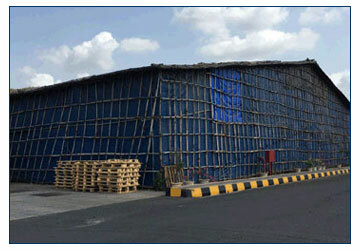 HDPE Tarpaulins are used for Side Coverings as well. ◊ For Companies requiring Long Span and Higher Height Sheds, we make use of MS Trusses and MS Pipes for greater stability and longer reliability. When the contract period ends, our team takes the responsibility of dismantling the shed transporting the materials back to our godowns..